"Elmer Valo was a journeyman outfielder who managed to stay in the major leagues for twenty years. He was an average hitter, but an exceptional pinch hitter, particularly in his later years. 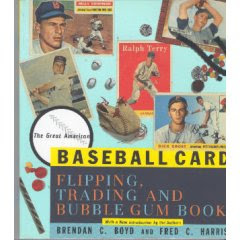 What I will always remember Elmer Valo for, however, will be his spectacular catches in deep left field in Philadelphia's Connie Mack Stadium, catches that inevitably had him crashing into the wall and crumpling dazed to the ground, with his glove in the air and the ball still in it." 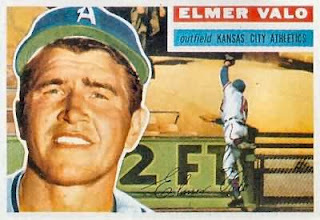 To my knowledge, Elmer Valo is the only Czechoslovakian-born player to reach "The Bigs." That, alone, makes him one of my all-time favorite players. After all, I am proud of my Czech heritage and so I followed Elmer Valo's career far more closely than that of more famous ballplayers like Mickey Mantle or Willie Mays or Wayne Terwilliger. The Great One's nickname -- "Wall Crusher" -- is both descriptive and accurate. There is some dispute about whether or not he entered the final game of the 1939 season as an 18-year-old pinch hitter. Many claim this did actually happen, although the official records do not confirm this. (If he did play the team would have been heavily fined since he was not at the time officially listed on the Phillies' roster.) I mention this, because, if true, his major league career would have spanned a remarkable four (4) decades. Two more things about Elmer. His baseball card photos were often far above the average -- this one with the triple lens TV camera in the background being just one example. Also, believe it or not, during his long, productive playing career Elmer Valo reached base as often as Joe DiMaggio. That's extremely good company to be in, and so I cannot help but be puzzled as to why this talented, unassuming fellow isn't a household name -- except in his hometown of Rybnik, Czechoslovakia. A very good question from mrn. We immediately thought of Elmer Bernstein and we then turned our attention to Elmer J. McCurdy. The mummified remains of a failed bandit, Elmer J. McCurdy was found at The Pike, a Long Beach amusement park that ran from 1902-1979 (which is now The Pike At Rainbow Harbor). Elmer was discovered in December 1976, during the shooting of the "Carnival of Spies" episode for the TV show THE SIX MILLION DOLLAR MAN. A crew member was asked to move a strange waxy mannequin hanging from a rope. He did so and, whoopsie, an arm fell off - revealing either a human bone or a really thorough method of mannequin design (it was the former). Forensic analysis revealed it was Elmer, who died of a .32 caliber gunshot wound from a train robbery debacle. Viewing cadavers, especially cadavers of criminals, was a popular and lucrative form of entertainment back then (unlike today). In that way, cadavers were an investment. At one point in the 1930s, a former sheriff acquired Elmer for his wild west show as collateral on a $500 loan. Later, two con men claimed Elmer was their brother, took possession of him, and headed for California. They also encased him in wax. After his discovery by the crew of THE SIX MILLION DOLLAR MAN, he was buried at the Summit View Cemetery in Guthrie, Oklahoma on April 22, 1977. The state medical examiner ordered two cubic yards of concrete poured over McCurdy's casket so that he wouldn't be passed around again. Some of the TV show's crewmembers attended his funeral. 1. There once were people named Elmer. It wasn't just something you ate in preschool. 2. Elmer's body was used as collateral on a loan. Even back then, they'd give a loan to anybody.